We are now in the post-Steve Jobs era, and Apple is yet to prove it can innovate without its visionary. Apple’s new CEO, Tim Cook, is not considered the same visionary that Jobs was, but instead more of a manager. 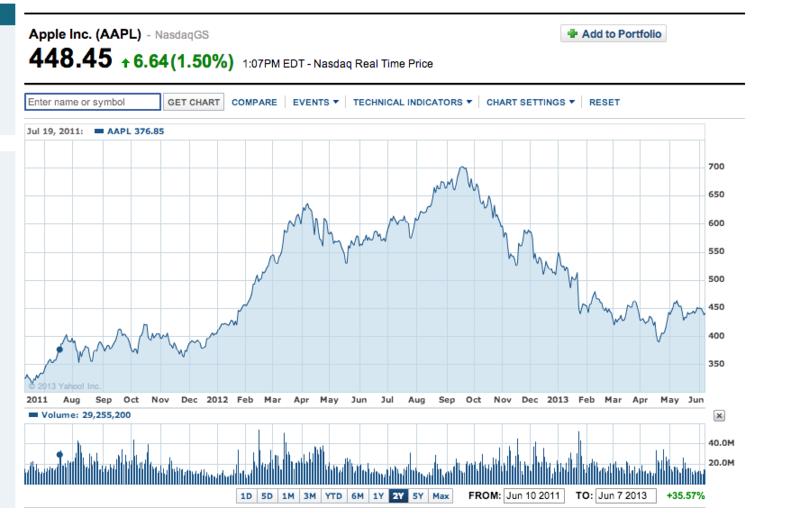 This has concerned Wall Street as to Apple’s growth potential, and this worry has shown in the stock’s performance. Today, Apple kicks off its weeklong Worldwide Developers Conference (WWDC), where Apple engineers and developers will introduce new products. Some major products Apple is expected to unveil are its new mobile operating system iOS 7, its computer operating system OS X 10.9 and a music streaming service (that may or may not be called “iRadio”). Everyone, especially investors, will be watching closely; not only looking for new, but also ground-breaking. We finally get to see if Apple can still be the inventive company it was under Steve Jobs’ reign. Of course, this won’t be clear until these products hit the markets. But be sure to watch Apple’s stock price to gauge reactions to this week’s product introductions. There has recently been a major bond market sell-off, meaning many more people are selling bonds than people buying them. Because so many people are getting rid of their bonds and few want to buy, the prices of bonds fall. This is because there is more supply than there is demand. It’s because people fear the Federal Reserve will soon reduce its measures to stimulate the US economy. The Fed does this by injecting more money into the economy. As the Fed slows this down, inflation and interest rates go up. This causes bond prices to go down, and that’s why people are looking to get rid of their bonds now. Economic data is lately showing better conditions than in recent years, and that causes people to fear the Fed will scale back its help its been giving to the economy. Such a shift causes people to save more rather than spend, and sell their stocks and bonds to avoid losses. That is a stock and bond selloff. 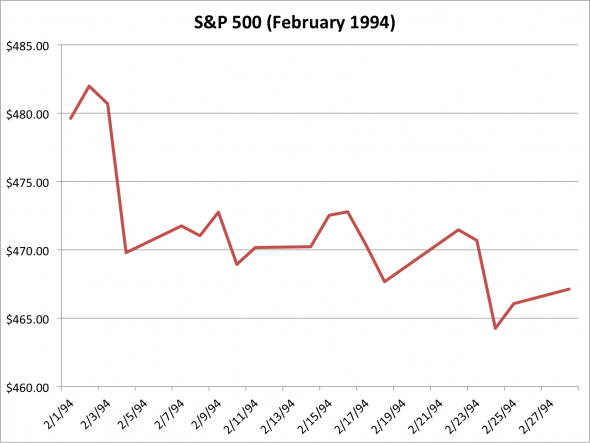 This is what happened in 1994, when the Fed raised interest rates, catching everyone by surprise. As a result, stocks and bonds plummeted. Now many fear we’re in a similar situation, where the stock market is looking way stronger than the rest of the economy. If people think this supposed “better economy” we’re in isn’t so much better after all, than we just might be headed for another “1994 moment”.